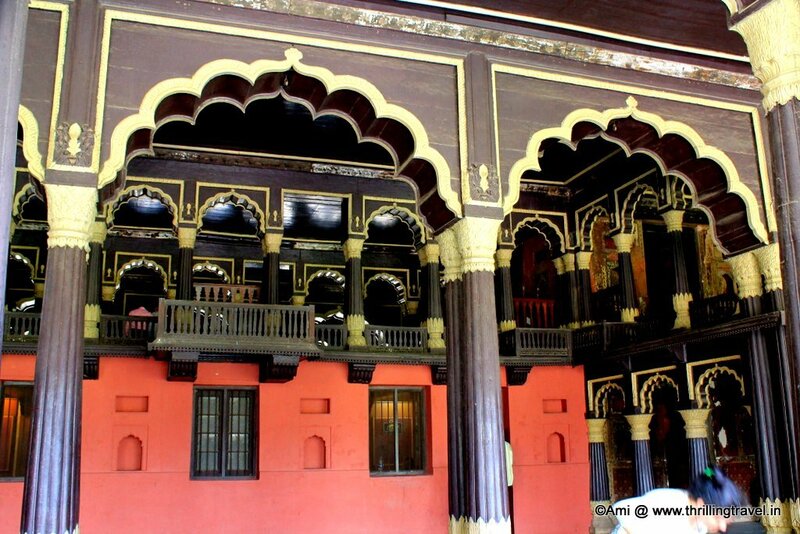 The Summer Palace of Tipu Sultan in Bengaluru is an unusual palace, with none of those marble carvings or intricate motifs. It is instead, made of wood and has a charm of its own. I rediscovered it through the #MakeHeritageFun trail by GoUnesco a fortnight back. The first part of the trail that involved a tour of the Bangalore Fort can be found here. I have detailed out not just the story of the Bangalore Fort but the history of Bangalore city itself. It was here that I had mentioned that the original Bangalore Fort covered a huge area and what was left of the fort was just merely 5%. The Summer Palace of Tipu Sultan was enclosed in this huge area. 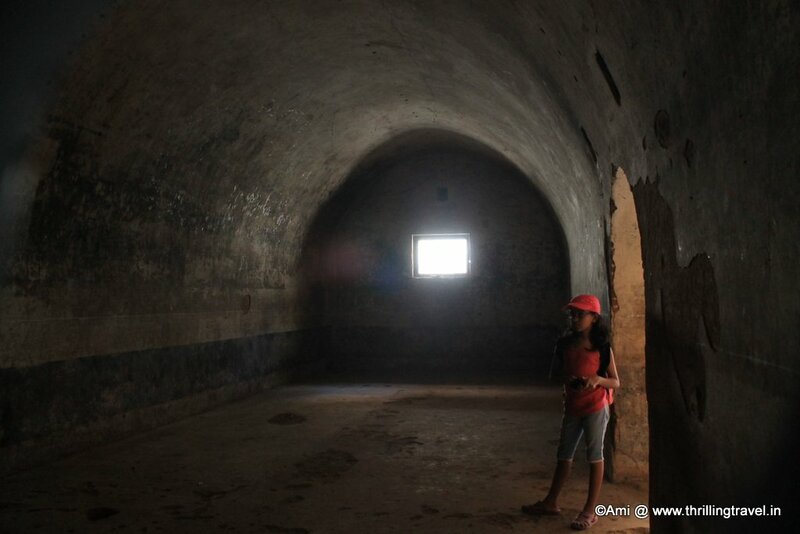 Let me take you through the tour of this palace, starting from the place I last left off – The Bangalore Fort. As we exited the Bangalore Fort, we walked past the old Victoria and Vani Vilas Hospital. Mansoor, who was guiding us told us a little tidbit about these two places. History has it that these hospitals were built with the same bricks and stone that were used to build the Bangalore Fort. Since the fort was destroyed, these stones were re-used to make these buildings. The foundation stone was laid down by the Maharani of Mysore Kempananjammani. 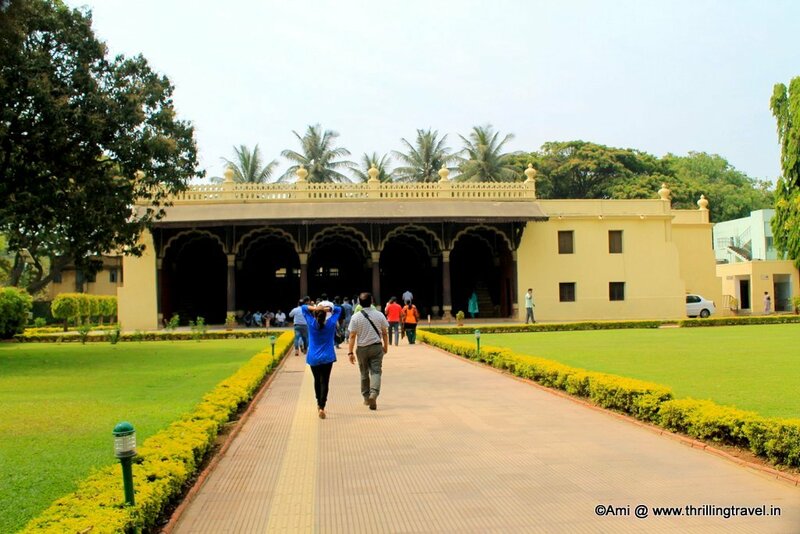 As you cross over the hospital campus, you get the first glimpse of the Summer Palace of Tipu Sultan. A beautiful wooden structure with dark brown teak wood and gold paint on it stands behind a well manicured lawn. As you near it, you can see two levels of the Summer palace – the ground floor with its enormous pillars and a level one with an open balcony area. The Summer Palace was built over 10 years – with Hyder Ali starting the construction and Tipu Sultan finishing it. Later, after Tipu Sultan died, it was taken over by the British and used as court or Attara Kacheri by the British. 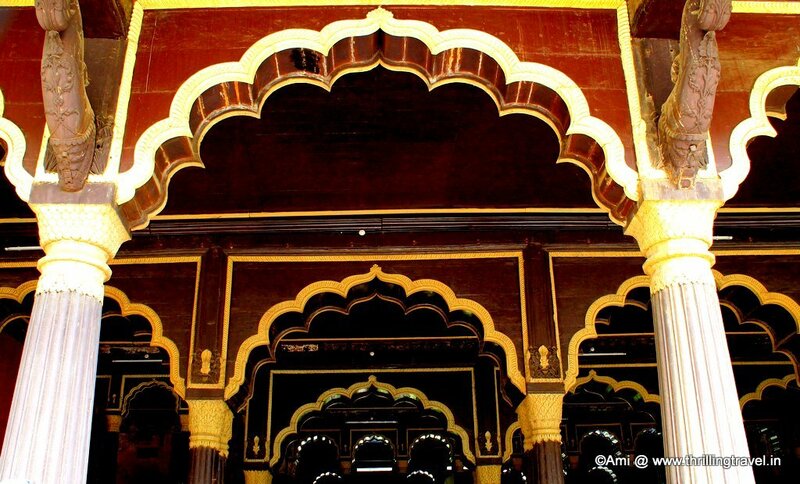 During its hey days, the palace was covered with floral motifs and paintings but sadly, none of that is visible today. What you can observe is the lovely use of Indo-Islamic architecture. The gorgeous arches of the palace reflects the Islamic influence while the brackets around the pillars are a little more Indian in nature. 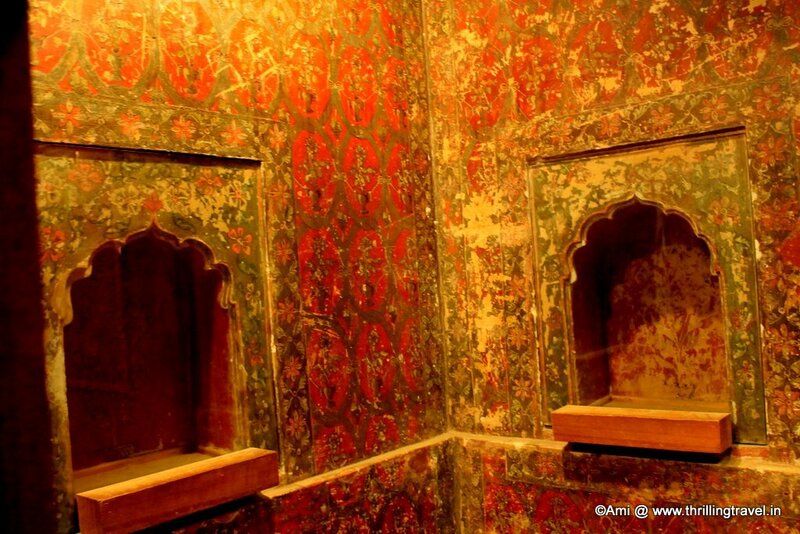 On the ground floor, there are two rooms – one each at each end, where you can witness the colorful interiors and walls of the palace. They say that these were covered with gems which were later removed and taken away after the British took over the palace. The paintings here are a further testament to the Indo-Islamic architecture of the Summer Palace of Tipu Sultan. The central room on the ground floor has been converted to a small museum with some exhibits belonging to Tipu Sultan. Since photography is not permitted in this room, I cannot treat you to the pictures. However, I can say this that a walk through this room will reveal how advanced was Tipu Sultan’s thinking and how innovative he was when it came to warfare. 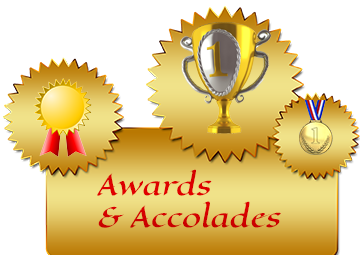 You can get a glimpse of the weapons he used, the perfection of the rocket technology and some of his other instruments. Pictures of his Tiger throne adorn the walls. This throne is said to be a huge one and history has it that Tipu Sultan never really used it as he had taken a vow to use it only when he had defeated the British. One of the other interesting things here is a toy or an instrument that was designed by Tipu Sultan. This has a tiger killing a British soldier. 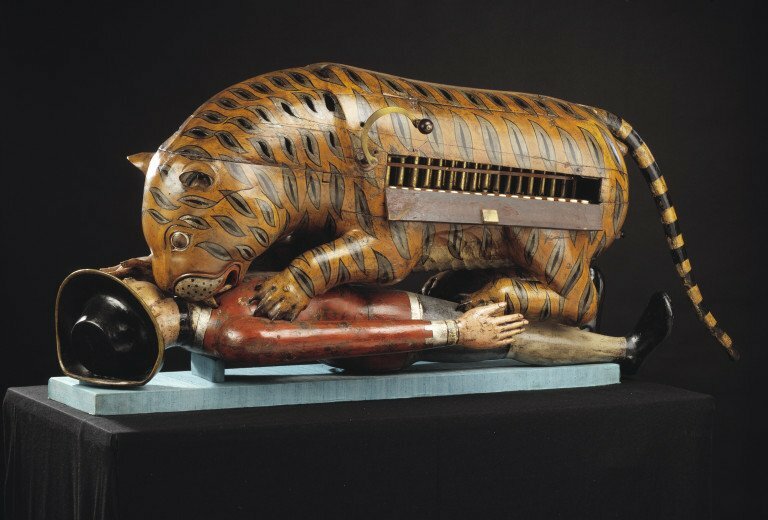 This was a wind instrument and when one blew into it, the tiger would give a roar while the soldier would whimper in pain. What you see here is not the original. To view he original, you will need to make a trip to the Victoria and Albert Museum, London. Exiting the ground floor, you can take the stairs up to the first level. The rooms that you pass through on the first level were the Zenana or the ladies rooms. Once upstairs, you will see that the balcony structure extends to both sides of the palace. Tipu Sultan used both sides to hold his courts. On one side – the side facing the entrance, was for public while the other side was for the courtiers. I remember coming here years ago, when we were allowed to step into the balcony area and take a look down. However now, you aren’t allowed to for your own safety as the wood structure could give way owing to age. Another interesting thing is that the first level could be accessed by 4 staircases, two in each side, facing each part of the court. Though simple, the palace is quite elegant. They say that what remains is a shadow of the original palace. In its hey days, the place was majestic and Tipu Sultan fondly referred to it as “Abode of Happiness and Envy of Heaven“. 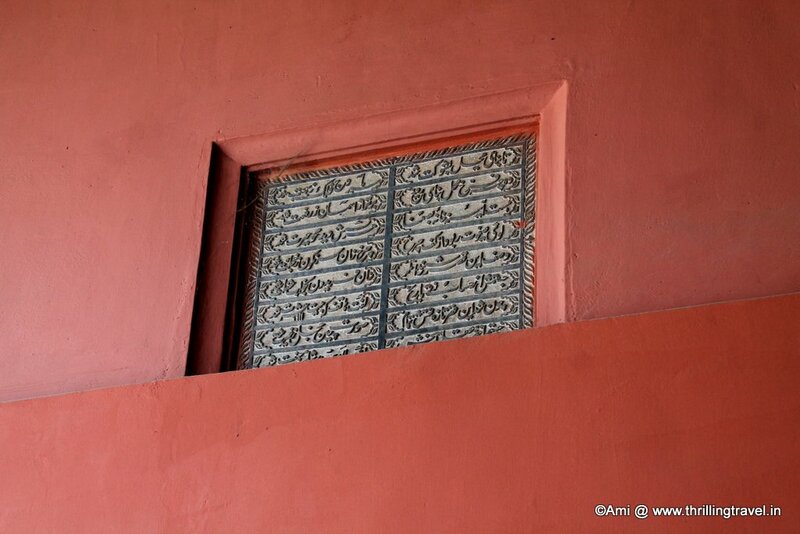 This was in fact, inscribed on the palace walls in Urdu. You can view the same on the left hand side of the entrance of the palace. 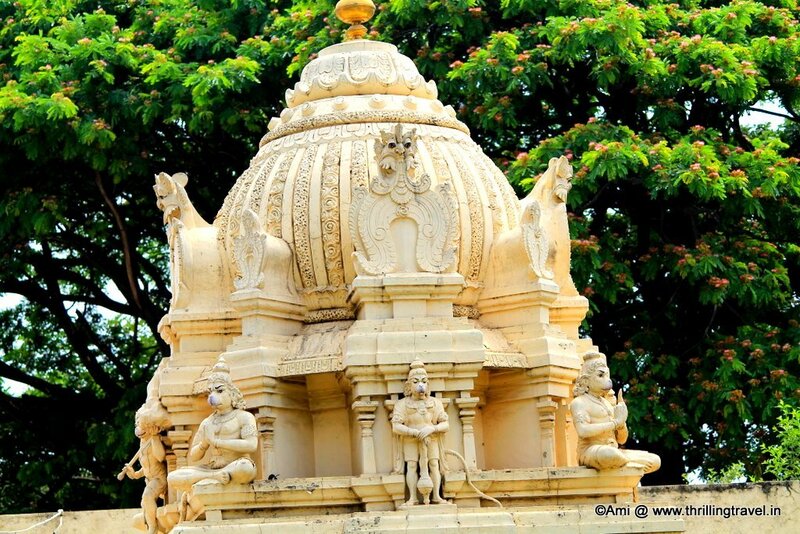 From the Palace walls, you will also, note a beautiful temple – this is the Venkateswara temple. Though I could not go inside, I could not help but capture the grandeur of its architecture, the detailing of its gopuram and entrance. Here are a few pictures of the same. On checking with Mansoor, I was told that the temple dated back to the late 1600s and was a part of the Bangalore Fort premises. I have my sights on exploring the same and finding out more about it. And when I do, will share the same with you. Having done the palace, we continued our walk to see one last monument. Sadly, the same is not even recognised by the archaeological society and lies in abandon. 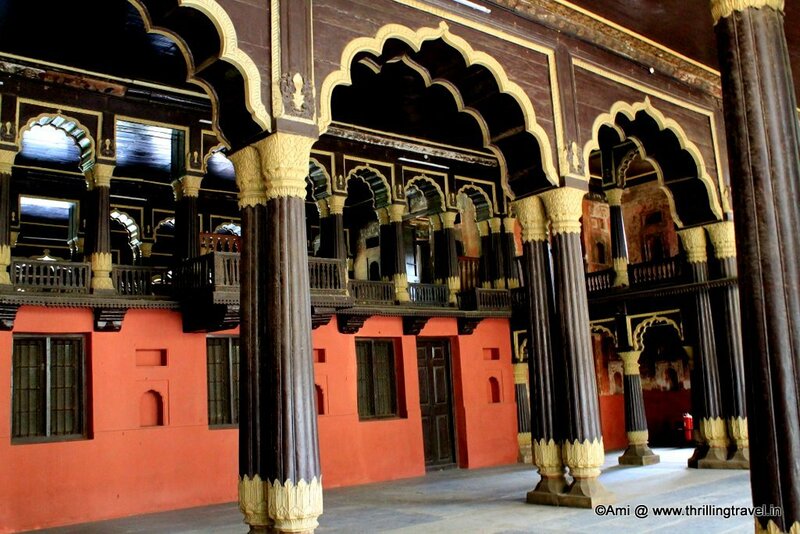 This is the armory of Tipu Sultan, where he stored Gun powder. 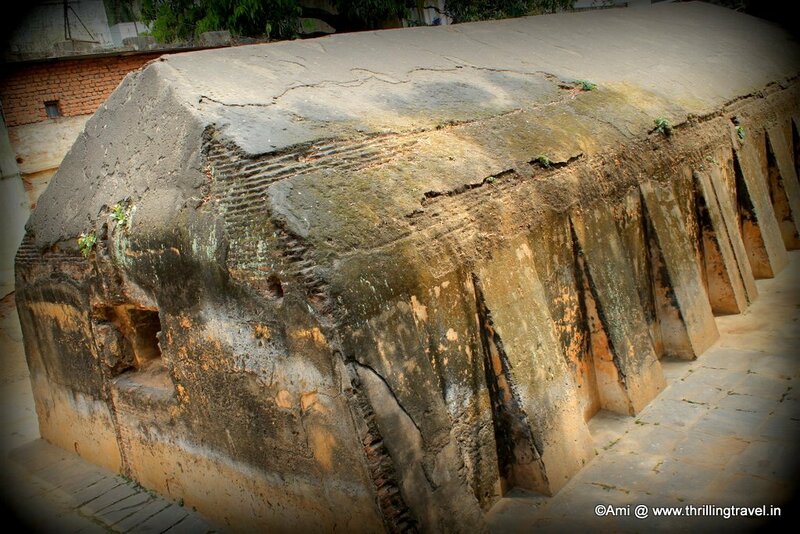 Right behind government schools and residential buildings, lies this piece of history. There is no guard, no sign board and one can just enter it. The place looks like a construction foundation and you would actually dismiss it for the lack of knowledge or sign boards. We walked into the armory just to get a feel of the same. All the while, I could not stop feeling disappointed for the lack of respect for this aspect of our heritage. I am told that even now, while there has been digging for the Bangalore Metro, coins, cannons and other relics of the past have been found. It seems that the area is full of relics buried under the sands of time. To me, this empty armory could have been respected and used as a small museum to showcase what was found in this area. I wish, we would take cognizance of the fact that this area in Bengaluru is a heritage site and that we are possibly, neglecting something precious in pursuit of some modernization. My heritage trail of Bangalore started on an upbeat note with the Bangalore Fort but ended with this neglected piece of history and some painful thoughts on the same. And for now, I leave you to ponder of it . Comment in below to let me know your thoughts on this. 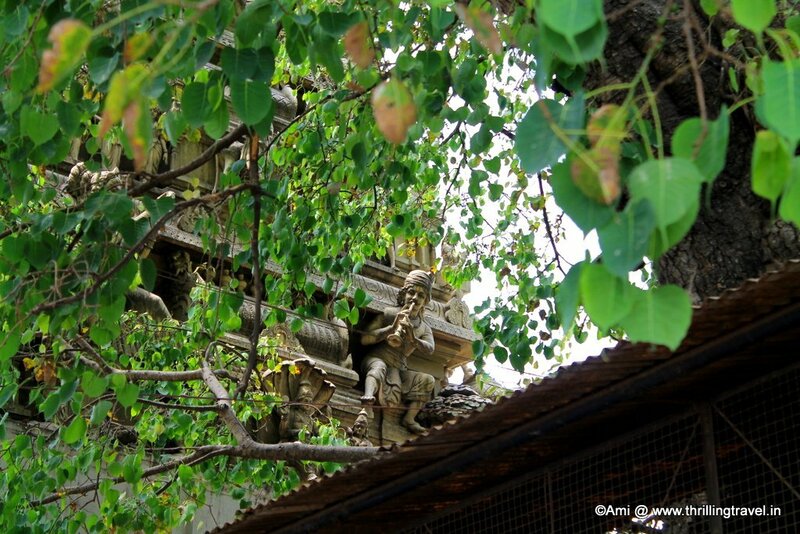 On how to get here and general travel tips, refer to this post on Bangalore Fort. Tipu Sultan’s palace and the armory are in the same area. 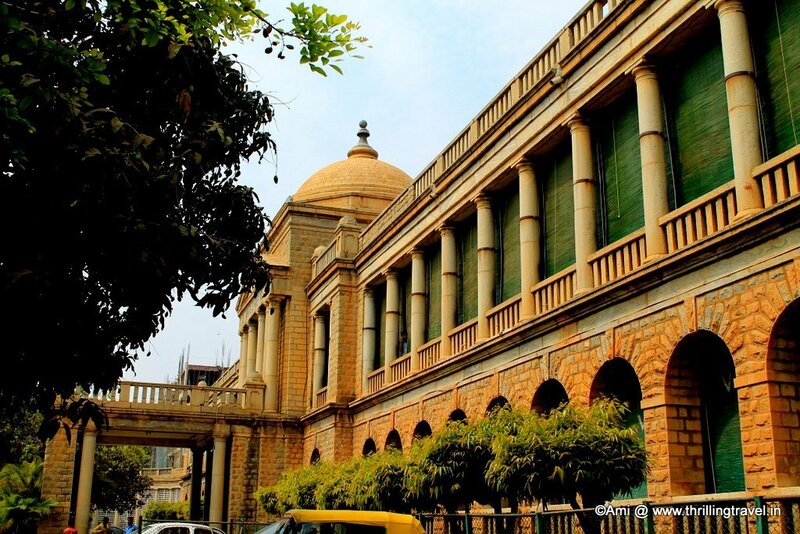 Keep aside 30 mins – 45 minutes to explore these two places in Bengaluru. I too wish we took more pride in our history and preserved it better! The palace looks grand! Yes Mridula, high time the officials take notice of the same and do something about it. Another beautiful structure to explore. You are tempting me into becoming a world traveler. Ha ha. And nothing wrong with becoming one. I loved your temple facade pics, very well taken. It never occurred to me to take its pics. The tour very well elaborated Ami. A nice detailed post, and those pictures. A fitting tribute to namma Mysurina Huli! What beautiful architecture! 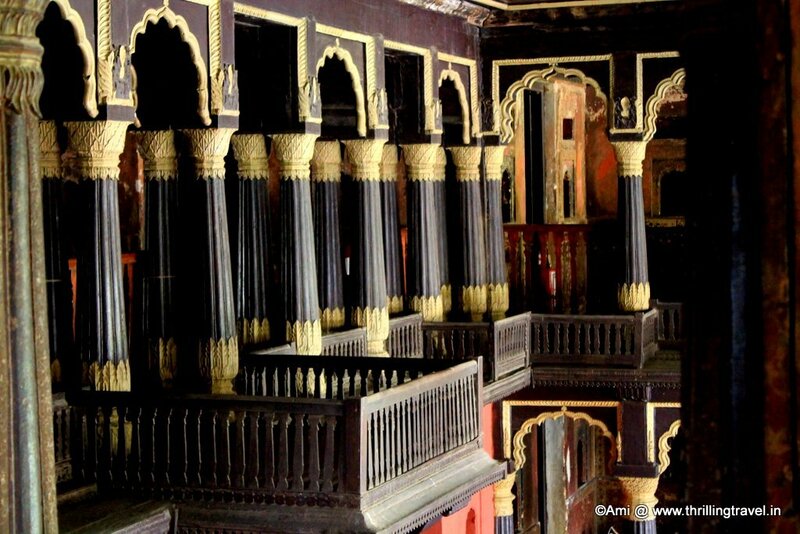 Tipu’s balcony reminds me of some aspects of the Maratha architecture. Thank you so much. Yes, that Harmonica did pique my interest as well and I too, looked it up in detail. Glad you enjoyed the narrative. Very intersting account of the palace and the armoury, AMi. Equally interesting bit on the Tiger organ too. You had rightly pointed out..we should preserve our heritage well. All this is priceless. Thank you Bushra. I hope we can spread the word and educate people on why and how to take care of our heritage. A very different kind of palace I have ever seen! I guess we are indeed neglecting it, high time we start preserving our heritage well! Thank you Arun. Hoping that the authorities realise the same soon and help preserve better. 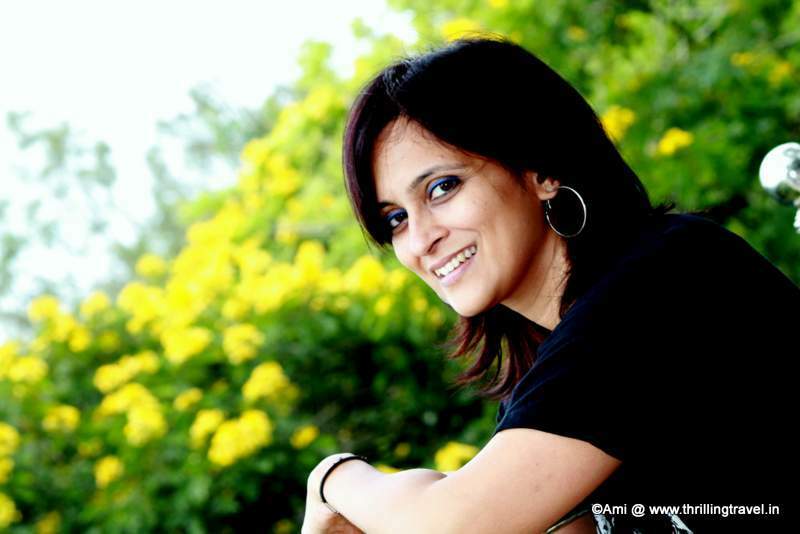 Thank you Shweta. Though I think you are referring to the Summer Palace at Srirangapatna. 🙂 That one is also, amazing. I have never thought of going to bengaluru. but this definitely makes me think twice. 🙂 And there is more. Have you seen the Bangalore Palace. 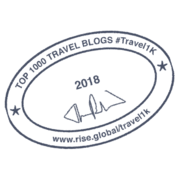 Check out my link on the same. 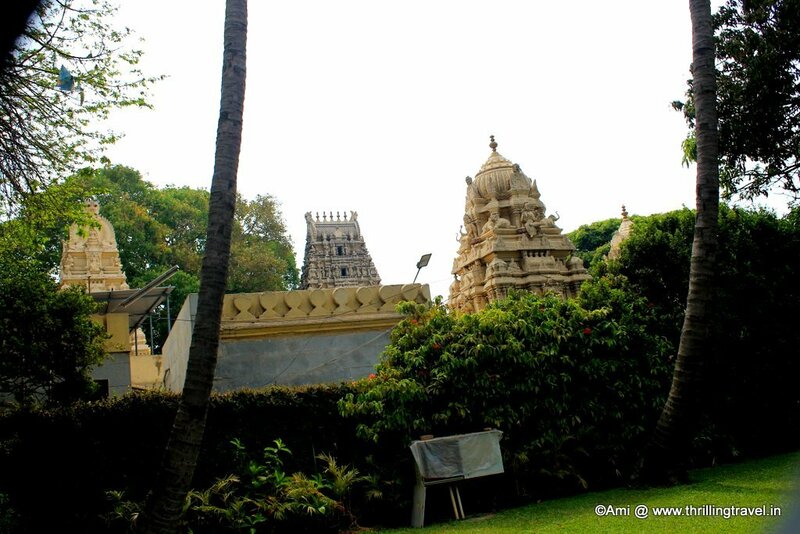 Did this walk around Bangalore fort area many years ago…your post made me go down the memory lane. Lovely photos Ami, they bring alive the beauty of the palace so well. 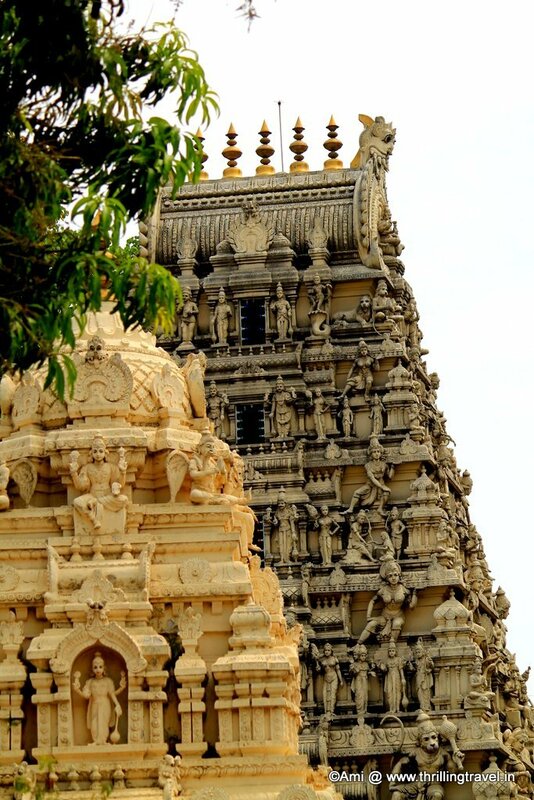 The carvings and details on those temples are stunning! Great photos Ami! I feel the disappointment quite a bit as we travel. Lots of places not putting the care, money or time into preserving pieces/locations of their culture and history. I hear you. It sure is sad. What interesting contrast between the old and new, the ornate vs the armory. I love the comparison especially all in one place. True. More so with the modern infrastructure around both these places. It surprises me that such a place, both historical and beautiful, is taking a back burner in preservation. I think that’s why it’s so important that travel writers are sharing their stories of more than beaches and city breaks, as it brings a more global awareness to heritage sites and teaches people on the other side of the world a little history that we’ve never learn in our own schools.